It's past time for a new blog post, but I'm just not achieving much photographically. So I'll post my choice for the 5th week of P52. 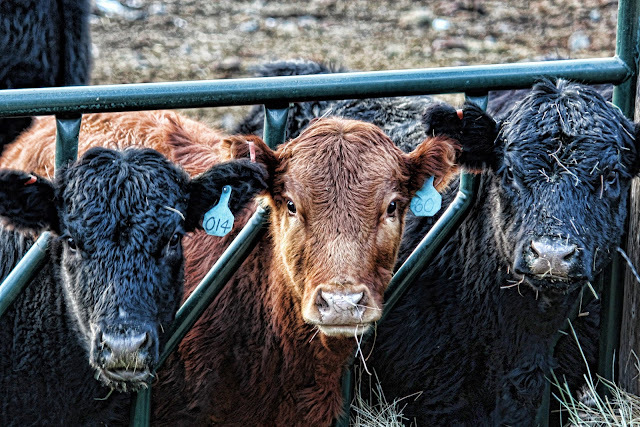 This bovine trio was photographed on a recent drive "to the country," which is relatively close to our house. These cattle are fed from the road....their "feeder" utilizes side of the road, which is very convenient. It also keeps the hay relatively dry as opposed to being in the mud of the feedlot. I thought these heifers were quite cooperative to stop chewing and look at me in unison. All lined up and looking like they just showered. Perhaps they knew you would feature them on your blog, Evelyn.